When I think of summer I think of being outside as long as I can. Most of us have heard that is not the case for many children across the country. With Wiis and Xboxes in many homes the great indoors hold much more interest to children then it did when my parents spent all day outside on their bikes, playing pick-up base ball, and playing in woods and swimming holes. We are lucky in the Upper Valley to still have a culture that values getting kids outside. Two local science and nature organizations have not only embraced getting kids outside during their summer breaks, but they have gone a step further to expose kids to activities and subjects that they may not have been exposed to without the camp. The Vermont Institute of Natural Science (VINS) in Quechee, and the Montshire Museum of Science in Norwich have a large number of camps scheduled this summer to get kids’ minds, and often bodies, in motion. I have to disclose my bias here. I’ve been visiting both the Montshire and VINS my entire life and love them both. In fact, I’m fulfilling a childhood dream by working part time for the Montshire. Even with my experience at both these local institutions of learning-without-realizing-you-are learning, I was blown away when I discovered all of the innovative day camps children can take part in. VINS is known for its rehabilitated raptors (birds of prey) so what could be more fitting than the Radical Raptors camp for youngsters entering grades four through six. Campers will be able to work behind the scenes with the bird rehabilitates and learn about training the birds. The new Nature of Food camp, also for children entering grades four through six, grabbed my attention as well. I think this camp would be a great choice for children from urban areas visiting relatives in the area. Campers will see the full circle of the food they eat, from the field to the plate. Campers will learn the history of New England agriculture while doing their own gardening. They will visit local farms, and end their week at the Baker’s Education Center at King Arthur Flour in Norwich making food out of the plants they harvested. What a great way to celebrate a summer’s week in a rural area. Theatre in the Wild, another new camp, also peaked my interest. 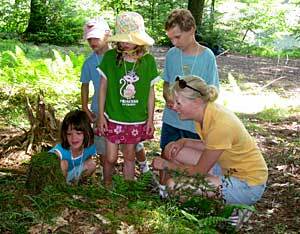 This camp is for children entering grades one through six and takes place at Storrs Pond in Hanover for the first four days of camp where they will hang out in the woods and the wetlands. With the help of the Post Mills organization, Vermont PuppeTree (http://vtpuppetree.org/wordpress). Campers will create their own puppets and put together an original puppet show based on what they learned about the natural world. What a great way to combine the arts with the the natural world. Over the summer months while working at the Montshire Museum I couldn’t help but notice how much fun the campers and the camp staff seemed to be having while they took part in their creative adventures. The Inventors Workshop Camp introduces children going into grades three through six to engineering. There are a number of sections of this camp, but one that stood out to me was a section that was open to only girls going into grades four through six. I asked Amy Vanderkooi of the museum education department, about why there was a week open to only girls. She said the museum was noticing only one or two girls were signing up for this Inventors Camp. They decided to try an experiment and open up a camp for girls only. The experiment worked. Fifteen to 18 girls started signing up for the week, and it has remained a popular choice. The Upper Valley Adventurers for children entering grades four and five, and the Valley Trekkers, entering grades six and seven, get campers out across the Upper Valley. They will scale mountains and forge the Connecticut River. They will have a new adventure each day, The Trekkers will go a step further with age appropriate expeditions around the area. There are even Montshire camps that mix the arts with science, including the new camp Exploring Light and Photography, where campers entering grades six through eight can construct pinhole cameras and learn about reflection. After learning about these camps, and the others available at the Montshire and VINS for preschool to middle school students I think the hardest part will be choosing which one(s) to sign up for. Registration is open, and they fill up fast! For information on these and other camps, prices, dates and times, please go to http://www.vinsweb.org/index.php/discover/nature-camp for VINS camps and http://www.montshire.org/summercamp2011 for Montshire camps. This post was written by our bi-weekly guest contributor, Anna Super. Anna is a freelance writer, taking on projects as varied as magazine stories to entertain readers, and copy writing projects that help businesses and organizations connect their products and services to their customers. She holds a Bachelor of Arts Degree in journalism from Keene State College, and was a staff reporter at the former newspapers The Connecticut Valley Spectator and the Argus Champion. Anna can be reached at Anna.Super01@gmail.com.